<- Read the previous post: We’ve Docked on the Rock! As usual, I slept in late for a day off, but this time it was with Patrick by my side. With the time change, it still felt pretty early to him, but it was a great treat for me. Al and Terry headed out early to sightsee, but Bill and Betty jo were still around, because there was to be a phone interview, but that got rescheduled to Monday. So we drove into town together. We split up with Bill and Betty jo, as they had already seen the sights on their last trip. 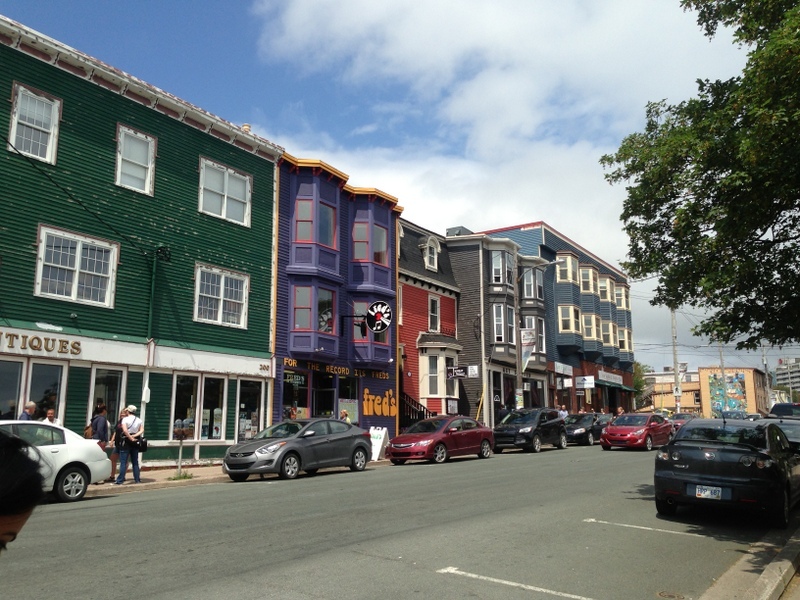 We walked around all the famous areas – Water St, George St, down by the harbor, the war memorial. We had a really interesting conversation with a local who works on one of the ships that service the off shore oil rigs, doing underwater maintenance and surveillance on the equipment. Very cool, very different from oil wells at home. We’re planning on eating as much seafood and fish as possible while we are in a place that we can get it off-the-dock fresh. I had a delicious fish stew at Get Stuffed. Mussels, shrimp, scallops, cod, salmon, all in a tomato and pernod broth with julienne veggies……mmmm. Patrick is determined to have cod every day he can. We wandered into a music shop, and Patrick is now trying to figure out how to get an “Ugly Stick” home on the plane. We picked up some prints of the colorful row houses, and generally played tourist. We also searched out the cycle shop we would be using to send our bikes home. We met with Bill and Betty jo again, went home to prep for the concert tonight. Ed and Terry joined us for dinner beforehand, and suggested good down-home cooking at the Classic Café East. 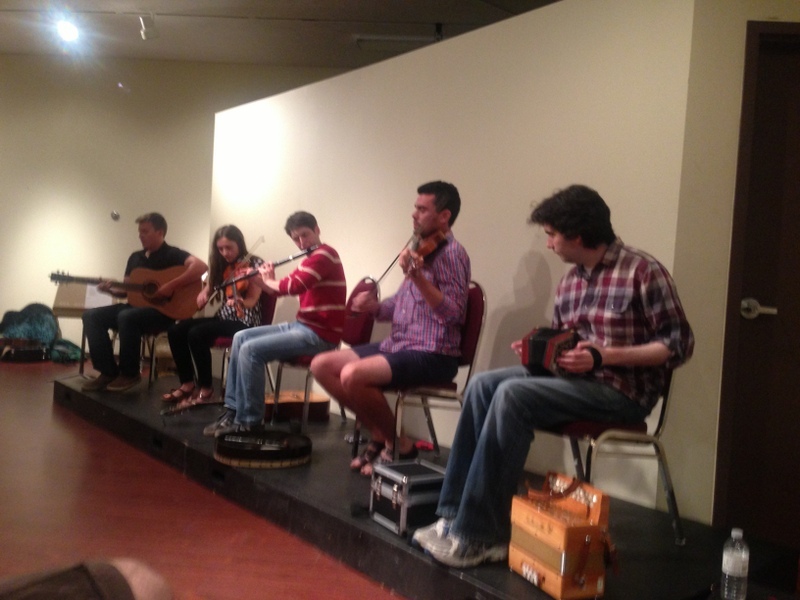 They were quick and very accommodating, because we had to get to the Arts and Culture Centre at Memorial University of Newfoundland. Our final concert was very special, and so fitting for our wrap up. 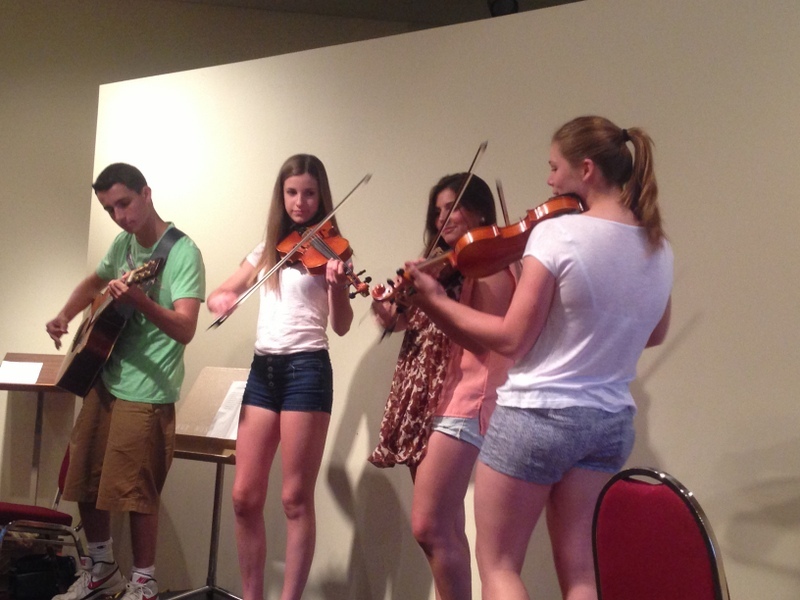 The whole program was young musicians, many of them playing traditional music. Do not misinterpret young to mean amateur. 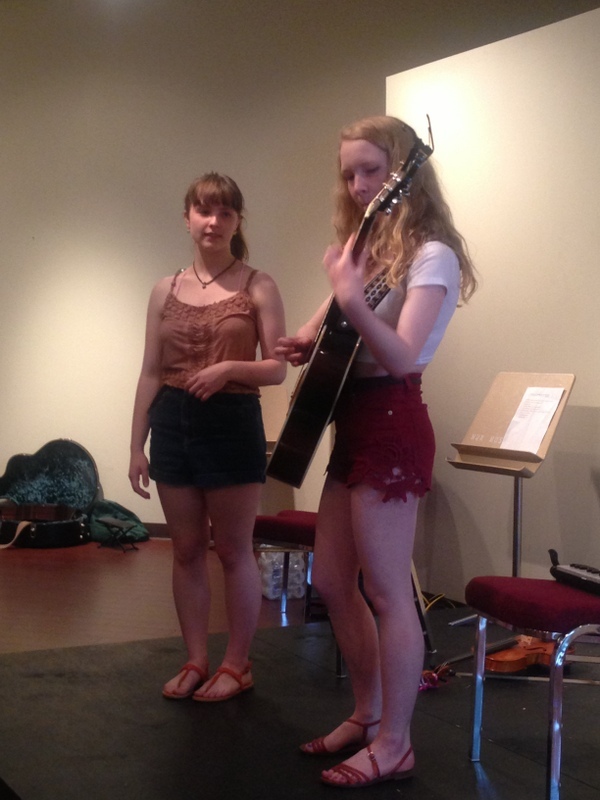 Every performer was polished, well-spoken and played beautifully, with many of them multi-instrumentalists and playing their own songs. It was very upbeat and uplifting, and they all spoke about how they connected with and valued the message we are carrying. 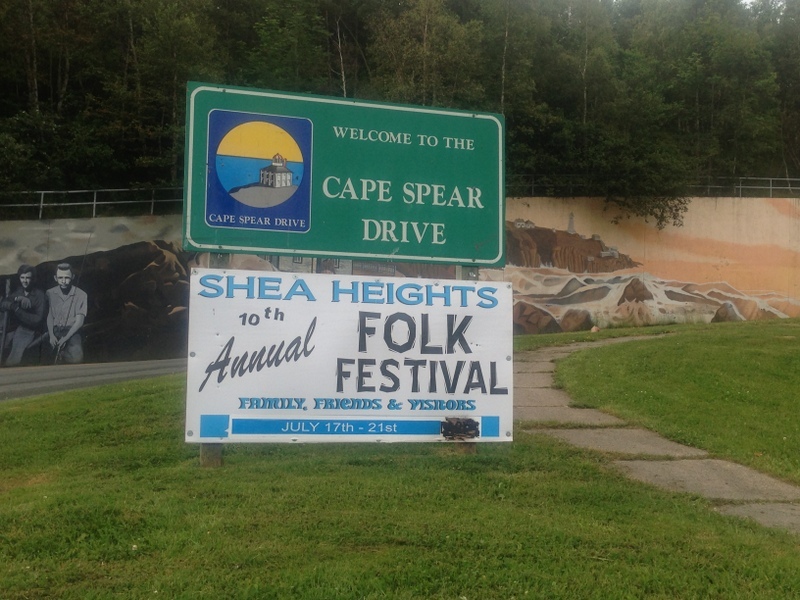 Jean Hewson, the first lady of folk in St. John’s, organized this concert on short notice. I can’t believe the quality of the talent she brought together, and the fact that they represented the age group we are trying to speak to, it was magical. I hope that Bill’s words about Hillary had an impact that they will carry forward with them. 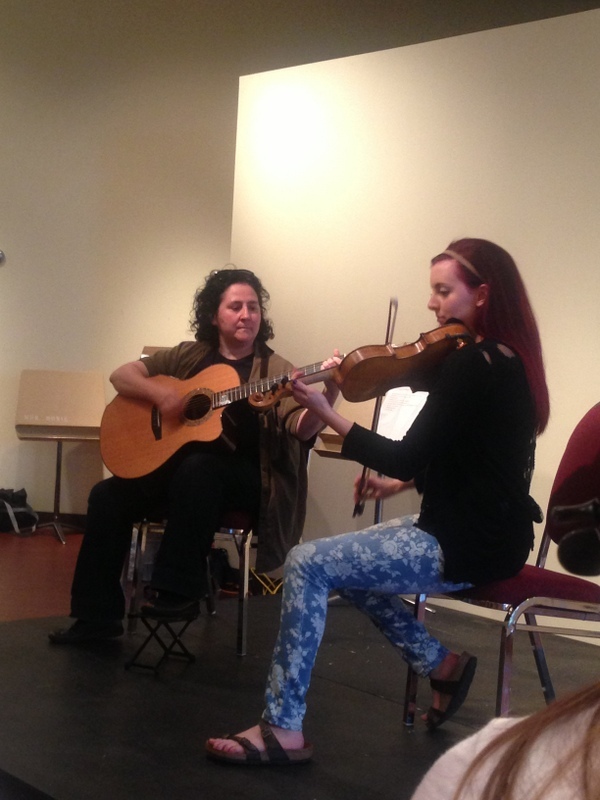 Thanks to all the performers: Jean Hewson and her sister Valerie Hewson, Esmee Gilbert and Leslie Amminson, Naomi Brown, William Corbett, Danielle Greene and Leah Sing, and The Freels. All up and coming artists, I’ll be looking for them in the future. Well, today was the day. 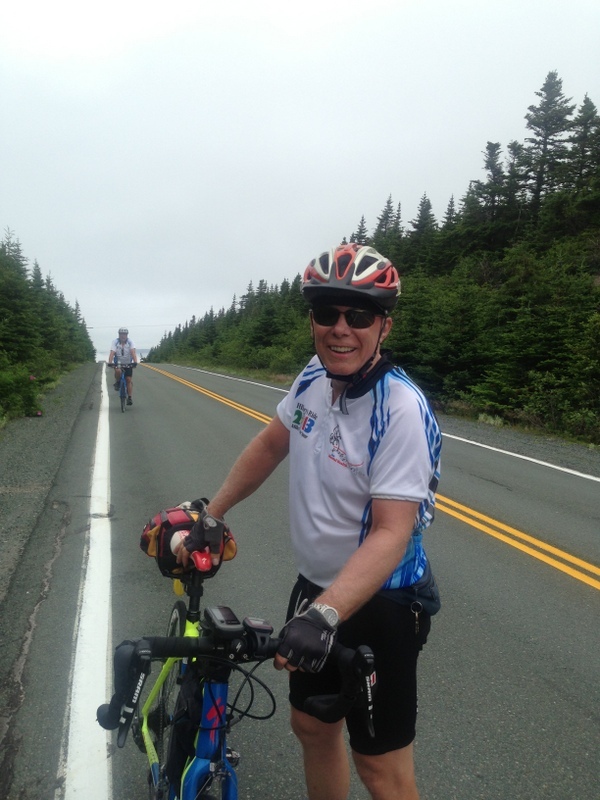 We only have 25 kms to get to Cape Spear, the most easterly point in all of North America, but it is mostly climbing. We were meeting a CBC reporter there by 10:00 am, so we wanted to give ourselves plenty of time to get there. It was super hot last night, and our hotel didn’t have air conditioning, so I don’t think any of us really slept. It doesn’t matter though, as adrenaline got us up the hills. And something eerie happened on the way up. My “new” computer had stopped working around Fredericton. I had felt quite lost at times, not knowing how far I had gone, how fast I was going, and how long I had to go, so I was riding “on faith” that I would arrive in due time each day. Right after climbing the steepest hill, it mysteriously started working again. Although it appears that it was corrosion that stopped it earlier, I choose to believe that when I knew there was no stopping me from completing this, that faith had carried me there, I no longer needed to cycle in with the unknown. Arriving to the top was bittersweet for me. It doesn’t feel like the end of the road today. We’ve been doing this for so long that I can’t imagine it being over. As we came over the last hill and coasted downhill into the parking lot, with Al, Patrick and Betty jo cheering, it felt triumphant and sad at the same time. You spend so much time planning and making it happen, that you don’t always visualize what the end will be like. It was an emotional finale, and it was appropriate that it was completely fogged in, because the whole trip feels like a fog to me at the present moment. Did we really do this? I hardly remember being in BC and the prairies right now. Some very astute people have reminded us that it will be some time before we can process the whole trip, and realize how it has changed us. We all waved our Canadian flags and and put our final Newfoundland stickers on our helmets, along with the Canada flag, to complete the set of flags on our helmets. I will be retiring my helmet after the trip. We also had to do the ceremonial dipping of our front tire in the Atlantic, since we started with our rear tires in the Pacific. The only water access there was a steep, precarious hill down to the slippery rocks and sea. The last thing we wanted to do was end the trip with an accident, so we took off our front tires and hiked down to the water to do the dip. I had to take my shoes off, as the cleats are on the outside and really dangerous on rocks. We waited for a wave, and side by side dipped our wheels. 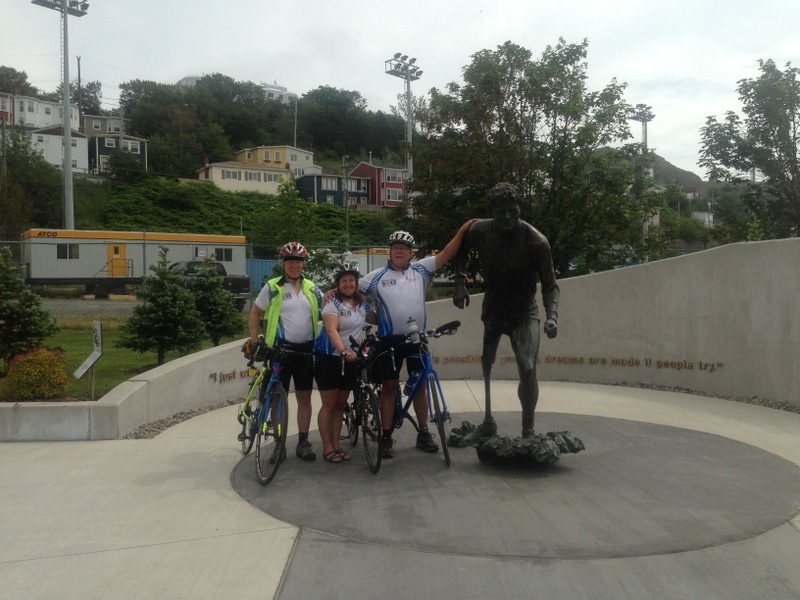 The last order of business was to load the bikes and get down to the Terry Fox memorial. This is the third one we visited on our tour, and it was important to us all to honour him for inspiring journeys like ours. It is right in downtown St. John’s, and is beautifully done, his bronze likeness running towards the west. I had to say goodbye to Pinky for a few weeks, as we took our bikes to Canary Cycles to have them boxed up and shipped home. I will see you again soon, my loyal friend, and we will enjoy a ride together on home turf. So it is complete. This afternoon we head with Terry and Ed to their home further south in the Avalon Peninsula, where they are hosting the six of us. Terry heads home tomorrow, to reunite with his wife, Vicky, and his two loving border collies. Al, Betty jo and Bill will be staying until Tuesday, enjoying the whales and scenery. 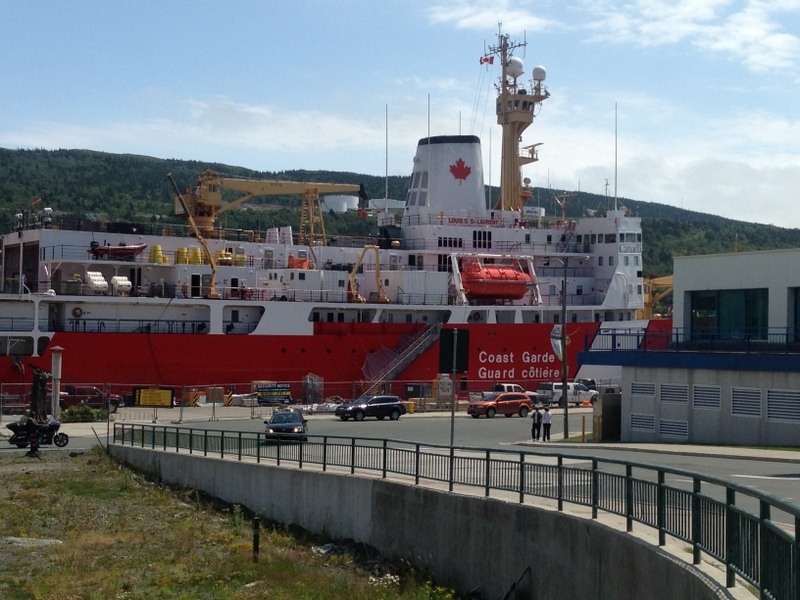 Patrick and I continue our adventure, heading out to Gros Morne Park for hiking and more Newfoundland culture and food. And soaking in what we have just accomplished. 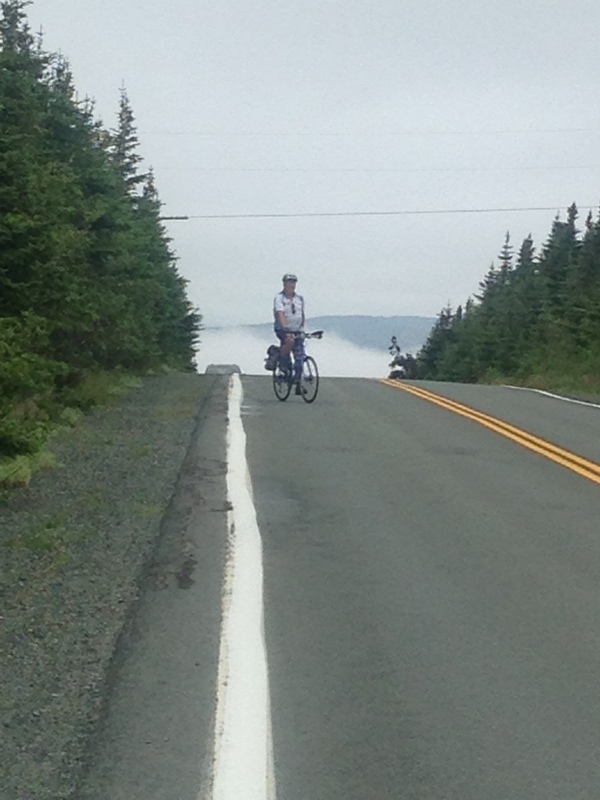 Cycle across Canada – check. 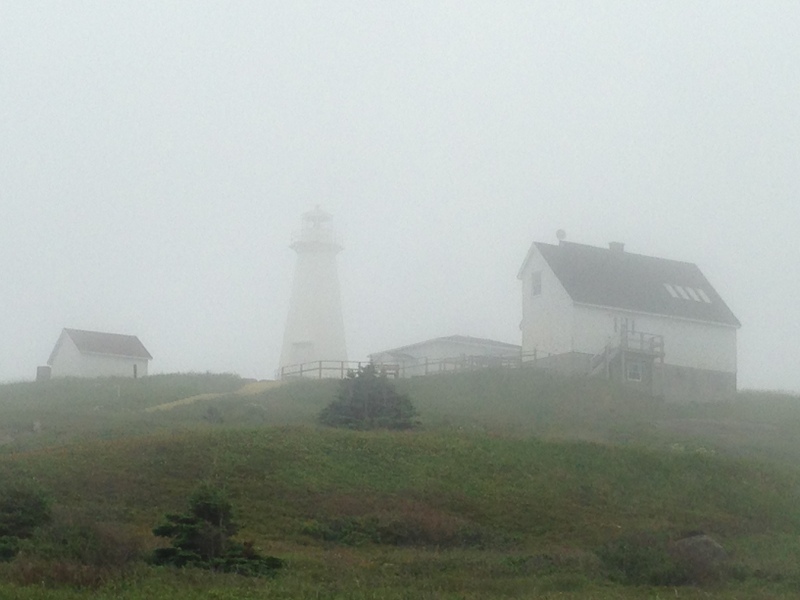 See more photos from the final day, at Cape Spear, N.L. This entry was posted in Riders' Ramblings, Sue Sohnle by Sue Sohnle. Bookmark the permalink. Wow what a journey! Thank you for sharing it! Congratulations on completion of the journey and your contribution to awareness of suicide and mental health issues in Canadian society! Congratulations to you all on an amazing accomplishment and what I am sure in the end, when you have quiet time to think, will also have been an amazing emotional journey as well… you should all be very proud of yourselves as I know I am proud of you 4 for the time and energy you have taken to donate to this great cause! What a wonderful thing you have all accomplished. I am siting here with tears in my eyes thinking of our 15 year old granddaughter and the pain she is going through dealing with mental illness, cutting and depression. I think the most important thing you all have done is the opening of the door for people to talk and be aware of youth mental heath and to remove the stigma of a hidden disease. Along with the money you have generated through concerts, donations and your physical efforts is a hidden prize which you will never find the answers to. How many lives have you changed? How many lives have you SAVED? Well Done. Hope to see you soon in Canmore. Love you all. wow….I can’t believe the journey, at least this part of it, is done…Now it is up to everyone to carry on, to bring on the conversations, to heighten people’s awareness about mental health, suicide and what we as a caring people can do to alleviate the suffering that so many of our young people are enduring. Job well done Hillary’s Ride riders. My heart is bursting with pride. Sue, I shall miss your blogs. It kept us all in the loop and entertained and on more than one occasion brought tears to my eyes as you touched on the trials that many of the people you encountered on your journey have faced. Now I look forward to seeing you all on your return to Edmonton and hearing first hand your accounts, Thank you and bless you for all you have done. Congratulations on a truly noble journey. The Wadden family is very proud of your victories over what must have been many very harrowing moments that were ultimately overtaken by many, many heart warming experiences and a huge sense of accomplishment. Well done!! CONGRATULATIONS to you all for cycling all the way and raising awareness of mental health issues. From what we have heard and read we feel you have achieved your aims. We have been with you in spirit all the way, feeling for you especially early on when you were battling against the Rockies and a strong, unexpected headwind. You realize of course that you were nearer to England on the East coast than Edmonton!! Where were the cycle water-skis to get you across the Atlantic to visit us?!!! Well done! We are proud of you and we look forward to hearing more in the Autumn when we come to Canada. 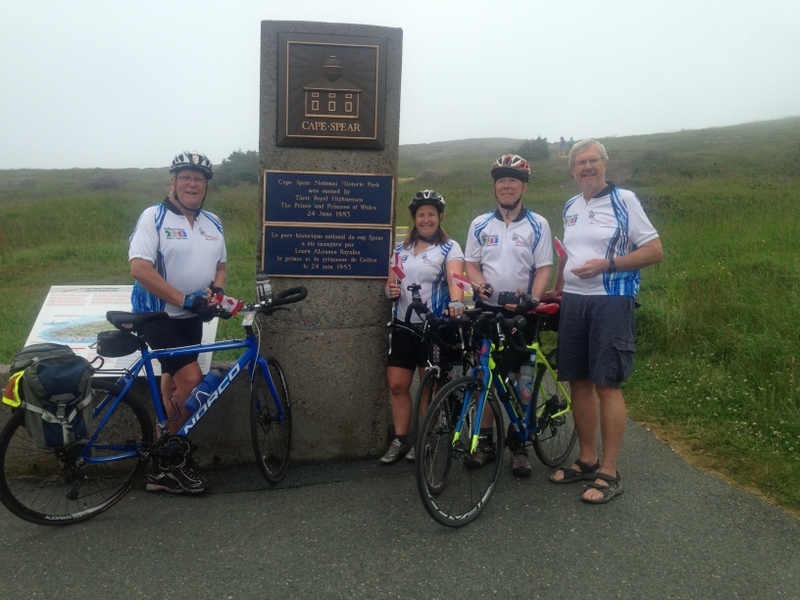 Congrats to you, Sue, adn your cycling pals – just a wonderful accomplishment and journey. Not easy, but y’all persevered. Your blogs kept us all “there” with you – it’ll make a great movie!!! Who will play you??!! See you in Edmonton soon!!! Well done Sue, Bill, Terry and kudo’s to all the people who supported you in person & from afar, with special mention to your support driver & photographer, Al. You’ve accomplished a wonderful & amazing thing. My hat’s off to you. Cheers, – Randy & Jane. Congratulations Sis! Congratulations Team Hillary! What a great team success. What a great personal achievement for each of you! And what a special final day on your long, challenging, successful journey. So many great memories (and pictures!) to reflect on and talk about in the weeks, months and years ahead. What a special, loving tribute and inspiring gift to Hillary and her memory. I’m sure she has a smile on her face and tears in her eyes (as do others of us) reflecting on your tribute and “pay-it-forward” gift to those facing similar struggles. We salute you for your inspiration, time investment, dedication, and stamina in reaching your goal – we are so very proud of all of you. Going forward, we will use your story as a great opportunity to help “spread the word” that mental illness is something that everyone needs to be open to talking about. And do so when warranted – an opportunity for us to contribute by example. The more who do, the easier it is for everyone else to do likewise. And we also want to send out a “thank you” to all of your support team and contributors in helping organize the fundraisers, awareness events, journey logistics, interviews, etc, etc. – what a great “extended team” you had. Congratulations – you have all completed a demanding physical & emotional journey. The journey itself may be over but the work will continue by many as I believe Hillary’s spirit has now touched many across this great country of ours through your Ride. Kudos and may those conversations flow. Help is never far away. We are so proud of you accomplishment Sue, and the team ! Thank you for giving to others in words and actions. You are all an inspiration to all, and as you digest what this experience has done to you and for you, know that what you have done to others / for others is the greatest gift of all. Congratulations Bill, Terry, Sue and Al – you did it!! Thank you Sue for the wonderful blog, and kudos to those supporting from behind the scenes. I hope the ripples started by Hillary’s Ride will continue to spread far and wide. Sue, it was great to hear that you finally got to do the “dip” with the North Atlantic. Congratulations! We have enjoyed hearing about the trip, and have really appreciated your thoughts as things went by. And it was great to hear that you let Patrick sleep in on your last day. 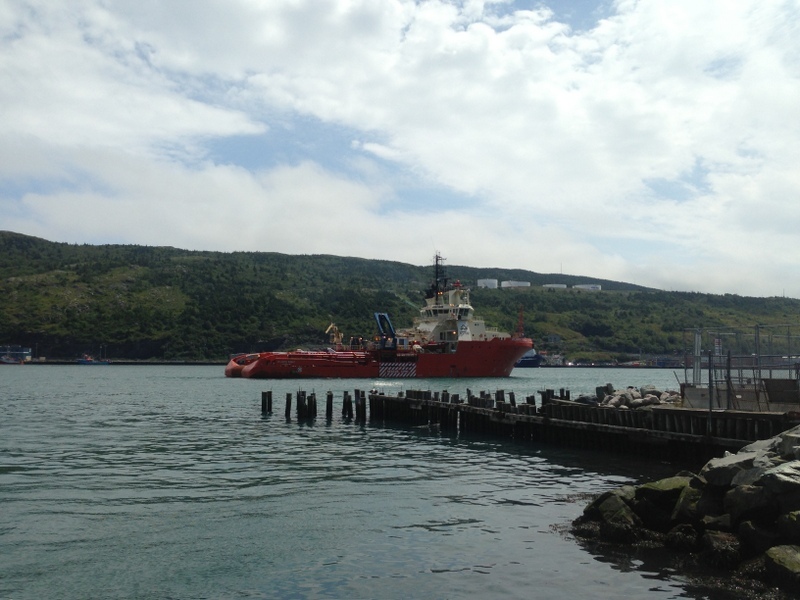 Newfoundland time can require a bit of an adjustment for us flatlanders. Take care and see you when you get back! What an amazing journey, Sue. An achievement that so few of us will ever manage, let alone contemplate and as a messenger spreading words of such importance. Well done our friend!